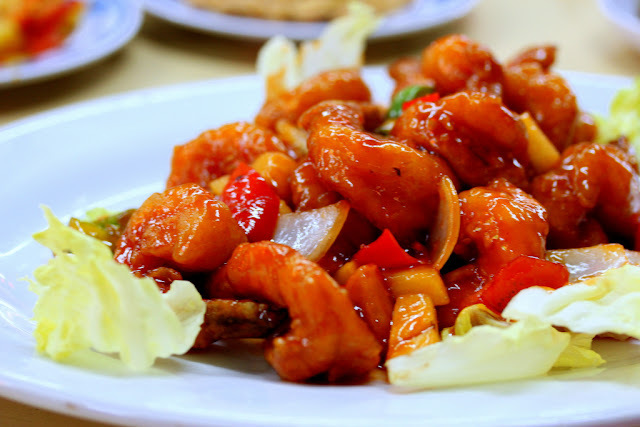 Sweet and sour pork is originated in Canton, Southern China province. It's deef fried bite sized pork stir fried in sweet and sour sauce, whilst some greens and pineapple are added. Probably, this dish is the most popular Chinese dish in the world. This easy recipe of sweet and sour pork always worth a try. 1 Combine the pork,salt and pepper,rice wine,sesame oil and cornstarch. Set aside for 10 minutes. 2 Combine soy sauce,rice vinegar,sugar and tomato sauce. 3 Stir fry garlic and add the pork. 4 Stir fry the bell peppers,onion and carrots. 5 Add the sauce and some water. Add salt and pepper as needed. 6 Add in the cooked pork and diced mango. 7 Allow to simmer for a minute. 8 Garnish with spring onions.